Pench National Park in Madhya Pradesh has been one of the popular destinations of Madhya Pradesh Tourism. Madhya Pradesh attracts many visitors from all over the world just because of presence of these Wild sanctuaries which has been one of the attractions for tourists lately. The most important reason behind this attraction has been the Sight of the Endangered Beast who has shortened up in numbers and may just be a picture in the books in the near future. The Tigers are present throughout the world in a very small population, and reserving an area within the forests without any activity which can harm the Tigers is a great thing in itself. And it is this tiger reservation which visitors mostly wish to have a look. The growing demographic of tourist visitors in this park is an living example of this curiosity which drives the tourist all the way to this tiger Reserve to check upon how the beast presently survives in just a few numbers and how exactly efforts are been taken to help the Tigers from the poachers. This park gained its recognition during the British Raj. 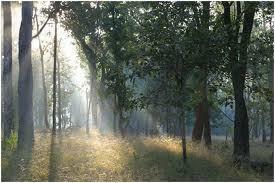 However Pench National Forest has never been a hunting ground for the Royal Families of India. It was only after the constant efforts of the local citizens that the reserves went on to conserve and finally with the foresight of Mrs. Indira Gandhi, the Late Prime Minister of India, this park gained a secure umbrella of Conservation for reserving up the wildlife. The growing number of tourists brought great demand for accommodation which in turn flourished the Tourism. Many MPTDC accommodation and rest houses are available for tourists who visits the park. Moreover, Resorts and Private Lodges too contributed towards flourishing tourism in this park. Here's a list of places which one can plan to visit once in the Park. The places of attraction are just within proximity to each other and one can plan a visit to these tourists attraction which are around the park. Rookhad Wildlife Sanctuary: Rookhad Wildlife Sanctuary lies adjacent to the park in the Seoni District of Madhya Pradesh. The Wildlife Sanctuary is commonly referred as Bison Sanctuary for the Rookhad Sanctuary is a home to many bisons (gaurs). The best time to visit Rookhad Wildlife Santuary is from Febraury to June. Being close to the park, it is a must-visit place. Pachmarhi Hill Station: Pachmarhi Hill Station is a beautiful hill station nestling amidst the Satpura Range in the Hoshangabad Districts of Madhya Pradesh. Pachmarhi Hill Station is roughly 200 km from the National Park and is one of the must visit places around the park. This is famous for its breath-taking landscapes, waterfalls and panoramic points. Mandla: The historical town of Mandla lies 196 km from the park and offers excellent sightseeing options which includes the famous Garha Fort in Killa Ghat. The drive from here to Mandla is exactly 3 hours. Mandla is a picturesque town which is surrounded from all the three sides by River Narmada. The Garha Fort in Mandla still stands tall depicting the memories of ancient history when it fought many wars with many great warriors in the History. Jabalpur: Roughly 206 km from the park, Jabalpur offers excellent sightseeing options. Jabalpur has many places which can be visited is an ideal one day picnic if one plans to visit this park. The points that one must pay a visit in Jabalpur include famous Madan mahal Fort, which was built by the Gond Ruler Raja Madan Shah. The Madan Mahal Fort manages to stand tall offering a panoramic view of the landscapes surrounding it. Other than Madan Mahal Fort, one can also visit Rani Durgavati Memorial, Tilwara Ghat, Sangram Sagar and Bajnamath which are examples of medieval constructions and also pay a visit to River Narmada where excellent Boat cruising options are available. Orchha Wildlife Sanctuary: Orchha Wildlife Sanctuary is located on the River Betwa and is a huge forest reserve which manages to appeal its visitors with its solitude and forest ambience. Orchha Wildlife Sanctuary is home to many wildlife and Birds. It is often referred as Bird Sanctuary for it houses around 200 species of birds. But most likely an adventure sport lover should definitely make a point of visiting Orchha Wildlife Sanctuary because of the adventure sports options it offers which include Trekking, Camping, River rafting, Boating, Canoeing and hiking. Like any other national parks across country, this national park too has its own fixed timings for Safari. The timings for safari changes as per the season, since the days in summers get longer and hence the safari times during Summer, are a bit early. But during winter, the safari timings are little later considering the fact that days are little short. Mentioned below are the Safari Timings during Winter Season and Summer season. This park is one of the best Tiger Reserves in India. Visiting this park can be a treat within itself. But visiting, when it is at its best matters a lot! This Park is best when visited during summers. Summers is the time when one can expect watching lot of animals visiting water-holes to quench their thirst. Hence it's best to visit here during summers. But the worst part about visiting this park during summers could be the fact that the climate can be extremely harsh and may get unbearable. The climate at the park can get extremes at time, with the temperature falling to as low as 4 degrees Celsius during winters to as high as 40 degrees Celsius during summers. Due to extreme rainfall, The park is closed for visitors during monsoons from Mid- June to Mid – October. This is the time when the park receives heavy rainfall and there are chances of floods which rush the animals to hideouts. Hence no one can visit park during this period. So the best time to visit this park is only from Mid – October to Mid – June, when the climate is at its best. Visiting the park, post monsoons could be a feasible idea for those who wish to experience the soothing greenery the Park is blessed due to rains. During Monsoons the park grows into thick dense vegetation with dark greenery spread everywhere. One can view and experience this greenery only when they visit here in the month of October up to December. Due to heavy rainfall and lush greenery the climate falls to an extreme to give a pleasantness and coolness which can be soothing to visit any national park. Hence for nature-lovers, it's an ideal time to visit the park. Vehicle: Rs. 1000/- per trip for Indians as well as Foreigners. Elephant Ride: Rs. 100/- for Indians and Rs. 600/- for foreigners.